The Guards is the Shamus award-winning novel which introduced private-eye Jack Taylor to the literary world. Taylor, probably author Ken Bruen’s most famous creation, is a washed-up alcoholic disgraced former policeman, who makes a living of sorts by sleuthing in his native Galway. The story begins with Jack Taylor busy at his regular daytime pursuit - sitting at a bar drinking coffee laced with brandy - when, naturellement, in walks an attractive damsel in distress. Her teenage daughter was discovered dead from drowning; the police are calling it a suicide, but the bereaved mother can’t bring herself to believe that her daughter would take her own life. She asks Taylor to investigate; Talyor agrees, reluctantly, and soon discovers a pattern of teenage girls whose drowning deaths were classified as suicides. The reader’s enjoyment of The Guards is dependent on whether or not they like Jack Taylor, the book’s narrator and principal character, and El Tarangu was not terribly impressed with Taylor from the outset. Jack Taylor just cannot seem to convincingly fulfil the private detective tropes, no matter how excruciatingly hard he tries. Take his dismissal from the police force (or “the guards” of the title, for our non-Irish readers); for reasons never adequately explained, Taylor decided to punch a parliamentarian. And the anguish that serves as one of the root causes of Taylor’s alcoholism – his Dad died. Losing a parent is sad and all, but Taylor’s father died a good age, and Taylor is a man in his forties – pull yourself together, man. Jack Taylor is just one of a several two-dimensional characters that populate the pages of Bruen’s novel. There’s Cathy B., Talyor’s rock-chick assistant, and Padraig, the wise old derelict, neither of whom are fleshed-out enough to make them in any way convincing. That being said, The Guards is not without its moments. The dialogue is sharp, and there are frequent flashes of black humour, particularly in the back-and-forths between Taylor and his curmudgeon barman, Sean. All things taken into account, however, the book left El T feeling quite disappointed. Although presented as such, The Guards isn’t really a mystery novel at all. The mystery is solved about 60 or 70 pages in, with the rest of the novel’s 250 pages documenting Taylor’s wreck of a personal life: he goes on a bender, goes to rehab, falls off the wagon and goes on another bender, during which time the reader gets very little in the way of progression of the plot. in the above manner. The intention was probably to give the novel a pared-back, hard-boiled feel, but the effect is often rendered redundant by Bruen using the device to list details extraneous to the story. Throughout the novel, there are frequent references to books that Taylor has read, details that El T would ususally enjoy, but in the case of The Guards serve to underline the lack of narrative thread. 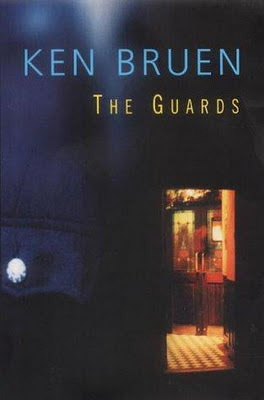 The book was a particular let-down given Ken Bruen is often listed among the leading lights of Irish crime fiction; rather than an actual mystery novel, The Guards is a 300-page rumination on a not-that-likeable main character, with added noir stylings. Not one to recommend, unfortunately. Buy Ken Bruen books from Amazon.